Cincinnatians who spend much time in the city’s urban core know there’s a big disconnect between popular opinion and reality. I’ll witness massive crowds of people enjoying amenities such as Washington Park, Smale Riverfront Park, and Fountain Square; or visiting the restaurants in Over-the-Rhine that often require hour-long waits on weekends; or filling up the unique music venues, bars and clubs on Main Street. Then in other parts of town I will hear people claim that there is “nothing to do in Cincinnati.” These people seem to be completely unaware of the slew of things happening throughout the city, but then go on to claim Downtown is unsafe. Washington Park panorama by Jake Mecklenborg for UrbanCincy. The problem is not aided by the fact that many of our city’s media outlets are schizophrenic in their coverage. Earlier this summer, for example, several of our local television affiliates produced stories about how much progress has been made in the Central Business District and Over-the-Rhine. And yet those same media outlets are quick to publish sensational stories that label these neighborhoods “dangerous” without providing any analysis of actual statistics to support their claims. Fortunately, Cincinnati has seen a tremendous amount of positive coverage recently on a national scale. The New York Times highlighted Cincinnati’s new riverfront, and the Cleveland Plain Dealer highlighted Cincinnati as a travel destination and provided a full weekend itinerary. Travel website Lonely Planet named Cincinnati as one of the Top 10 US travel destinations for 2012 for the amenities offered in the center city, and just last week, Next American City called Washington Park the tipping point that ensures continuing success in the improving Over-the-Rhine neighborhood. For these reasons, it is especially unfortunate that a self-proclaimed urbanist would publish a blog entry on the Congress for the New Urbanism’s (CNU) website that only furthers many of these misconceptions. The focus of this particular article intends to criticize Cincinnati’s modern streetcar project. And while the debate is welcome, the article relies on inaccurate information and misleading generalizations. Poppel says, “it’s very hard for me to accept that the streetcar is really what Cincinnatians want.” She dismisses votes of support of the project in 2009 (Issue 9) and 2011 (Issue 48), and the election of a pro-streetcar mayor and six pro-streetcar city council members. 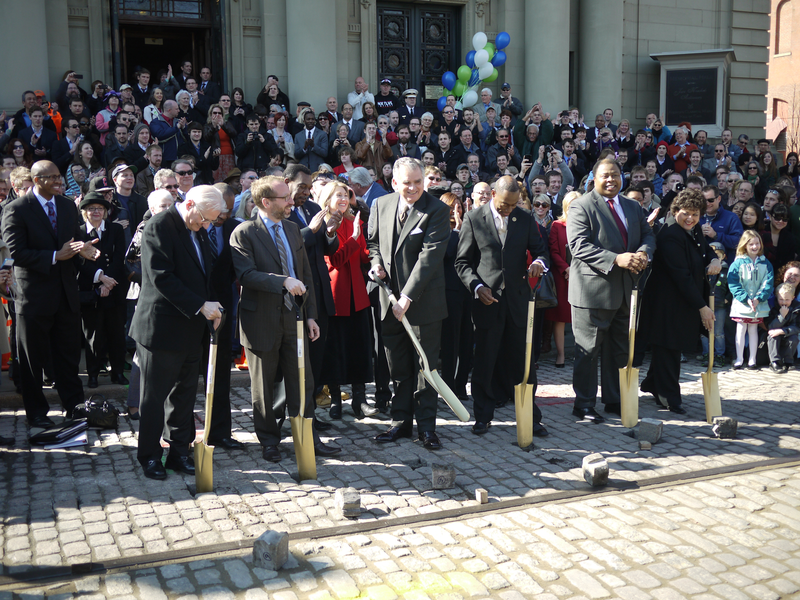 Ground is broken on the Cincinnati Streetcar as a crowd of supporters looks on. Photo by 5chw4r7z. She claims that uninformed voters may have been confused by Issue 48’s ballot language. While the language was certainly misleading, she fails to mention that the language was written by the anti-transit group who placed the referendum onto the ballot. Citizens Opposed to Additional Spending & Taxes (COAST) crafted the language and was proposing a charter amendment to ban any work by the city on any rail transit for the next decade. Voting “yes” would have approved the ban and therefore halt the streetcar project. Contrary to popular belief, the City was not involved in creating the ballot language. In Poppel’s article, she went on to hedge her bets against the streetcar project, by claiming the transit project will not spur as much economic development as the City, private industry, and academic reports are projecting. However, she claims that low-income residents will not benefit from the new “high-end boutiques and specialty restaurants” opening along the route. This common tactic has often been used by transit opponents to frame such investments as a lose-lose proposition. Another claim made by Poppel is that Over-the-Rhine is “the most deteriorated and crime-ridden region within Cincinnati.” While the claim is attention grabbing, it is supported by no evidence or facts. Furthermore, she fails to note that crime has been dropping in the neighborhood, and that a reduction in crime is typically associated with more “eyes on the street” that come from more residents and businesses, and fewer vacant buildings and darkened alleyways, in the neighborhood. By overlooking the details of Issue 48, failing to mention Issue 9, and repeating outdated misconceptions about Over-the-Rhine, it seems Poppel only has surface-level knowledge of all of these issues. CNU notes that they “welcome a healthy back-and-forth between different points of view,” and that opinions posted in CNU Salons and in comments are those of their respective authors, not of CNU. Unfortunately, CNU only publishes opinion pieces authored by dues-paying CNU members, so we decided to use our own platform to respond. For those reading this response that would like to respond directly to CNU, you can do so by leaving a comment on the original article, or by tweeting at CNU @NewUrbanism. Previous articleLooking to LA: Could a Rail Transit Tax Transform Cincinnati?